A vs B: Making Deadline. Did I Choose Wisely? On Saturday evening I covered two final matches in the 2A Northwest District varsity girls’ basketball tournament. As I was covering this for The Bellingham Herald, meeting the tight deadline was imperative. One minor problem: I had a 9:30pm deadline with one game starting at 6pm and the other promptly at 8. This meant I had to come up with a plan and execute it without a hitch. But that’s for a later blog. 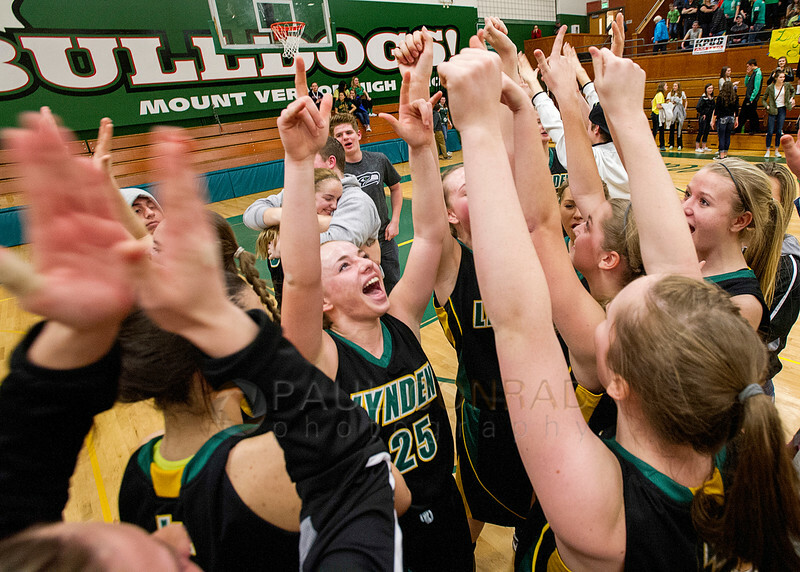 © Paul Conrad/The Bellingham Herald – Emily Holt (25), center, and the rest of the Lynden Lion varsity girls react to winning the 2A Northwest District girls’ basketball tournament defeating Burlington-Edison 67 to 55 at Mount Vernon High School in Mount Vernon, Wash. INFO: Nikon D3s with WB set on fluorescent light, and shutter at 1/250th, 17 to 35 f/2.8 set at 5.6. With this, I had my edited images to the paper for the first game by the time the second game started. I also had the online gallery posted. I shot the first half of the second game, worked on my images, then uploaded my 5 edits from the first half. 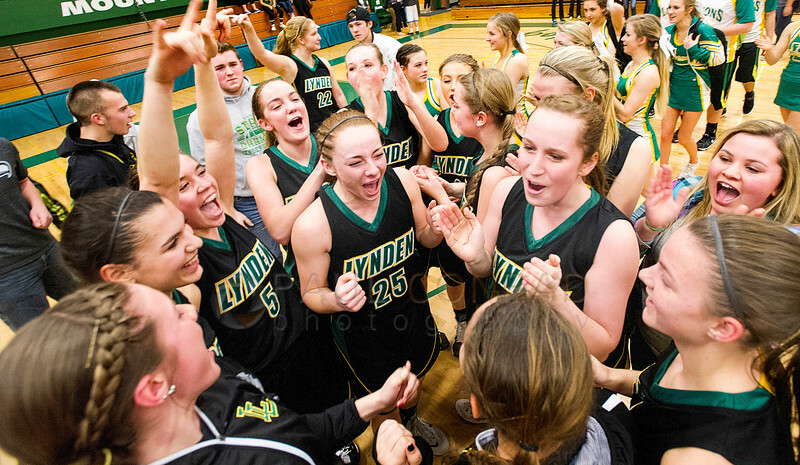 It was 9:10 and the game was still going so I called the paper to let them know Lynden was ahead and that I was going to shoot the reaction of them winning the District Title. At 9:15 the game ended. I rushed onto the court and began shooting. After a few minutes the celebration calmed down so I went back to my workstation, ingested the images, then chose one for sending. I made the deadline with 4 minutes to spare. Sometimes in the stress of making a deadline, we can choose the wrong photo. I think each of these has their merit. The strengths of A are: You can see all their faces, it’s a little cleaner, it’s easier to read, and overall a touch sharper. The strengths of B are: The raised arms show celebration, the girl is framed by the arms, the couple in the back hugging (which I missed in the first edit), and the overall excitement. If you were an editor and had to choose which one to put in print, would it be A or B and why? Thank you Keith. That’s why I like it as well. It’s just not a “exuberant ” as the second.